Optimized performance. 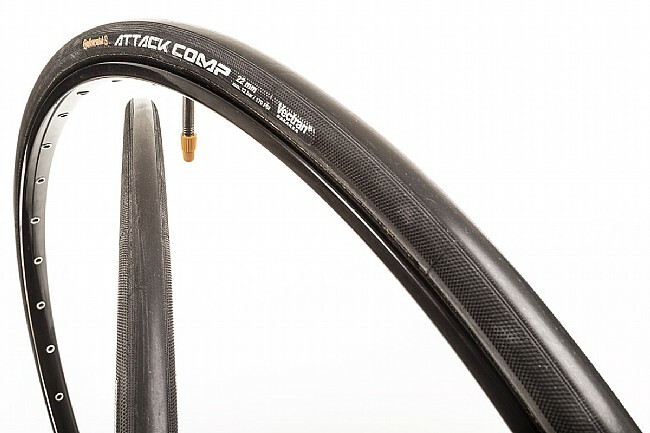 The Attack Comp Front Tubular Tire benefits from Continental's ultra-dense Black Chili compound for a fast roll with extended durability and exceptional grip. Its 22mm front-specific width offers an aerodynamic advantage and incredibly responsive handling. Vectran puncture breaker keeps out the sharp objects without slowing you down or negatively effecting the tire's ride quality. Water dispersing channels improve traction in wet conditions.